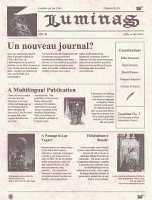 Luminas was an information journal about the Obscure World, published mostly for the benefit of the Lighted World citizens, in order to fill the vacuum left by the disappearance of Lumière sur les Cités. The information presented therein is varied, but perhaps not entirely reliable. See Télépénombrateur. 1983 - Publication in the French language of the first album in the Obscure Cities cycle: The Walls of Samaria . 1995 - ebbs.net goes on line. 1996 - Publication of the Cities Guide (The Guide to the Cities) and the urbicande.be Web site goes on line. 1997 - The Light on the Cities club is created. April 2001 - The club Officially Cease To Operate. June 2001 - Some members decided to carry on and, with François and Benoît Peeters's Schuiten approval, launch the virtual magazine Luminas . Today - Luminas IS ESTABLISHED well and Will continue to spread, we hope, for Many Years to Come!